Alderbrook is the residential community around Alderbrook Resort & Spa that lies along the southern shoreline of the Hood Canal just east of Union. With Alderbrook waterfront real estate you can look forward to enjoying a more laid-back pace of life that includes jaw-dropping views of the water, the Olympic Mountains and sunsets that beautifully splash color over it all. Many homes here include their own stretch of beach for digging up dinner, including mussels, clams and oysters, as well as casting a line for chum salmon in the fall. Just about every recreational activity on the water imaginable will be steps away, from boating and sailing to kayaking, paddle boarding and swimming. Hiking, bird-watching and biking can be enjoyed throughout the area too. 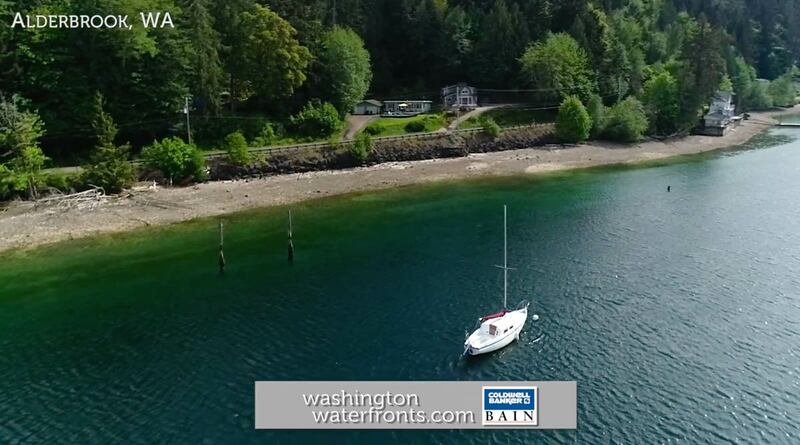 Twanoh State Park is less than a 10-minute drive away and offers a dock, moorage, watercraft launch, a tennis court, volleyball, horseshoe pit, wildlife viewing and 2.5 miles of scenic trails. Owning Alderbrook waterfront real estate brings the opportunity for the ultimate in relaxation, immersed in a tranquil atmosphere with outdoor adventure at your doorstep, yet you’ll also be able to take advantage of small town delights in Union with its handful of eateries and shops, art galleries and more. Look forward to fun community events too, including the arts-focused Traveler Days. Of course, you’ll be close to Alderbrook Resort where you can indulge in treatments at the full-service spa, enjoy outdoor dining or take advantage of the waterfront marina and its boat, canoe, and kayak charters. You’re likely to find more perks for the money among Alderbrook waterfront real estate, with some luxurious homes that are priced quite a bit lower than what you’d expect to find closer to the big city. Whether you’re looking for a year-round residence, a vacation home or an investment property by the water, this is an area that should be on your must-see list. Take advantage of our industry-leading tools to make your property search as easy as possible and be sure to register for a FREE account so that you can receive email alerts whenever new Alderbrook real estate for sale hits the market. If you’re seeking to sell your Alderbrook property, contact our Waterfront Specialists directly for a comprehensive listing analysis and to learn more about the cutting-edge marketing strategies we’ll use to sell your home quickly for top dollar!